"We just received our brochures and they look amazing! Thanks so much for the great job and being available for any questions. And, as always, the turnaround was amazing!" If you think "brochure" means a sheet of paper folded into a long rectangle, think again. Custom brochure sizes can deliver your message in anything from a mini-brochure the size of a business card to a jumbo brochure that opens into a poster - and everything in between. When combined with die cuts, custom sizes can truly give you something no one's ever seen before. At PFL, we have six standard brochure sizes, but we can custom cut your brochure into just about any size you can imagine. 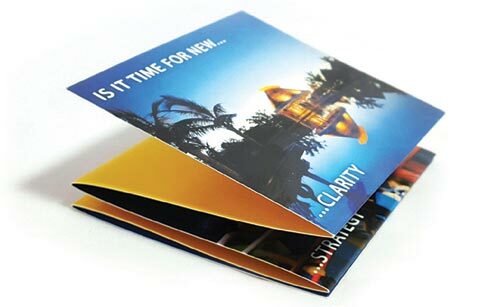 Custom-sized brochures instantly look and feel different, ensuring that your brochures get the attention they deserve. Custom sizes are available in just about any of our paper stocks, and they can be combined with a wide array of specialty printing effects to enhance the custom look. Make sure your custom size brochure is large enough to accommodate your text and images. Self-mailing brochures need to meet certain postal service size specifications. Brochures abound at tourist spots and trade shows, but custom sizes create a whole other world of possibilities. Custom size brochures can make memorable product promotions, keepsake posters, clever business cards and enticing invitations to take advantage of special offers. Design your brochures to display your most important information and images in an easy-to-read way. Use headlines, bullet points and high quality images. Custom sizes let your design take center stage because you can focus on the look you want without having to fit it into a particular format. Add die cuts and you can truly have almost any size or shape you want. When choosing custom sizes, consider where you'll be distributing your brochure. Small brochures are easy for people to stuff into purses or pockets at industry events. But a small brochure could get lost in a mailbox. Large brochures attract attention, but they're more awkward to carry around. Maps. Custom sizes let you scale the map to its actual proportions and print it in a size that's convenient. Quick reference guides. Print these as small brochures and they'll be easy to take along anywhere. Portfolios of projects or products. Custom sizes give a feel of quality and originality. To enhance the upscale feel of a custom-sized brochure, pair it with custom printing options like foil, embossing, metallic inks and spot UV effects. Need technical or creative advice on your custom sized brochure project? Give our helpful experts a call at 800-930-2423.
your information with anyone. Period.